That’s why I hope you’ll consider joining me on Tuesday, November 7th at the incredible McKinney home of JR and Keresa Richardson for a reception to support our campaign. Host Committee sponsorships are available at $250 per couple and above, or you may attend the 6:30 PM general reception for as little as $25. No matter your level of support, all are welcome, and it will be a great evening together! More information is available below, and you can RSVP by clicking here or on the image below. If you aren’t able to attend, you can still contribute towards the event by clicking here. 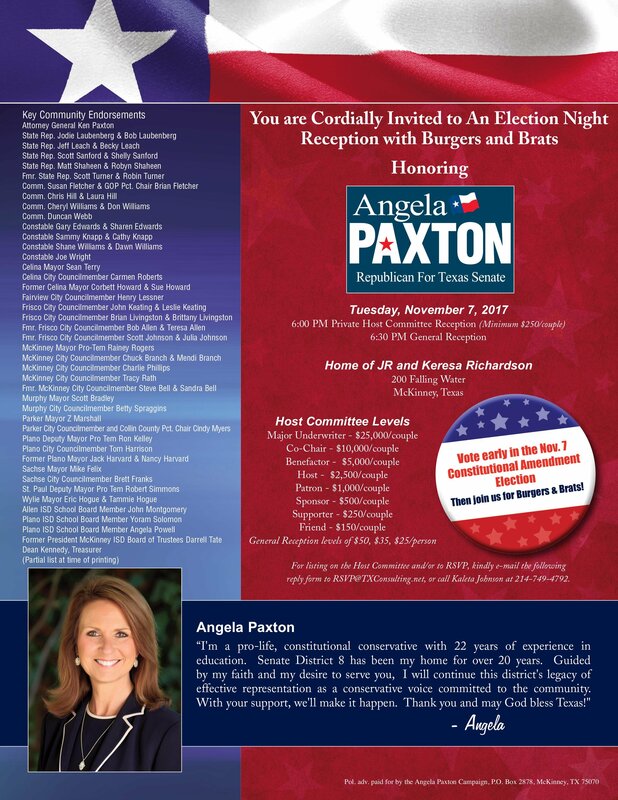 Please be sure to vote early in the Nov. 7th constitutional elections (early voting is underway now), then join us that evening for a time of fellowship with fellow conservatives. Mark your calendar, and I look forward to seeing you there!